Beauty World Skill Sector Council (B&WSSC) is geared up for the 45th WorldSkills Competition to be held in Kazan, Russia in August 2019. The WorldSkills Competition, a flagship event of the WorldSkills International, organised every two years, is the biggest vocational education and skills excellence event in the world that truly reflects the global industry. The competitors, all under the age of 23 years, represent the best of their peers and are selected from skill competitions in WorldSkills Member countries and regions. As part of Skill India mission, WorldSkills India, alternatively called India Skills Competition, is an ambitious initiative of the National Skill Development Corporation (NSDC) under the aegis of Ministry of Skill Development and Entrepreneurship (MSDE), Government of India. It is a platform to promulgate excellence in displaying workplace skills and learning through local, regional, national and international skill competitions, thereby creating a nationwide awareness, ownership, and participation within the Beauty & Wellness industry. B&WSSC has been the first SSC amongst all to conduct regional rounds of India Skills competition across the country, selecting candidates from 5 regional zones – West, South, North-East, East and North, covering the entire length and breadth of India. In 2016-17, it led to the participation at WorldSkills 2017 at ABU DHABI, in Beauty Therapy & Hair Dressing, and is in 2018-19 creating competitors who will represent INDIA in the upcoming WorldSkills 2019 at Kazan, Russia in August 2019. 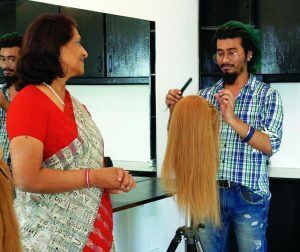 The Chief Expert at World Skills – Vaishali Shah (Beauty Therapy) and Deputy Chief Expert at World Skills – Samantha Kochhar (Hairdressing) continue to spearhead the entire cycle of competitions as well as assessments and training of the winners at all levels. Post India Skills National Competition in October 2018, in both the skills, B&WSSC conducted extensive Training of national winners, November onwards, supported by the Industry Experts from India and abroad. B&WSSC is also working on conducting Mind training as well as Fitness/Yoga training for the winners to deal with competition timelines and to maintain a calm demeanour throughout the competition, while they are being watched by more than 60 countries.